Iona, St. John's Cross, East face. Iona, St. John's Cross, west view. Iona, St. Martin's Cross. East Face, Close up. Iona, St. Martin's Cross. East Face, General View. Iona, St. Martin's Cross. West Face, detailed view of Abraham and Isaac panel, with top of David's head. Iona, St. Martin's Cross. West Face, detailed view of top panel of shaft, Daniel in the lion's den. Iona, St. Martin's Cross. West Face, Detail of lowest ornamental panel, and David and Goliath panel. Iona, St. Martin's Cross. West Face, Detail of Psalmist, David and Goliath, and top of lower panel. Iona, St. Martin's Cross. West Face, Detail of Psalmist and David and Goliath. Iona, St. Martin's Cross. West Face, General View. Iona, St. Martin's Cross. West Face, General View. Top. Iona, St. Martin's Cross. West Face, lower scene, detail of David and Goliath panel, left side. Iona, St. Martin's Cross. West Face, right of lower scene. Iona, St. Matthew's Cross, East face. 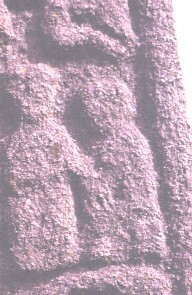 Iona, St. Oran's Cross, detail on shaft. Iona, St. Oran's Cross, detail on the front of left arm. Iona, St. Oran's Cross, front of upper arm. Iona, Stone with carved ship. 1. Iona, St. Martin's Cross. West Face, right of lower scene. 4.3 m high, 0.67 m wide, 0.26 m thick. West face of St. Martin's Cross tapering in width towards the top. The Royal Commission on Ancient and Historical Monuments of Scotland. Argyll: An Inventory of the Monuments. Vol. 4. Iona. 1, HMSO, Edinburgh (1982) High Cross, Archaeology, Scotland, Iona, Isle of Mull. Allen, J. R., Anderson, J., The Early Christian Monuments of Scotland , Pinkfoot Press, Balgavies, Angus (1993) Descriptions, Stone, Sculpture, Monuments, Scotland.